Also, welcome to a 45 minute long taxi line. While our research said to take the airport express into the city and cab, it failed to mention the taxi line or that somehow the ticket we bought put us on a bus not a train to the station. Oh well almost at the end of the travel day. Korean BBQ our first night in country. Blue House (where the President lives and works). Dan sitting behind a replica of the President’s desk. Street Food (with lots of kimchi). 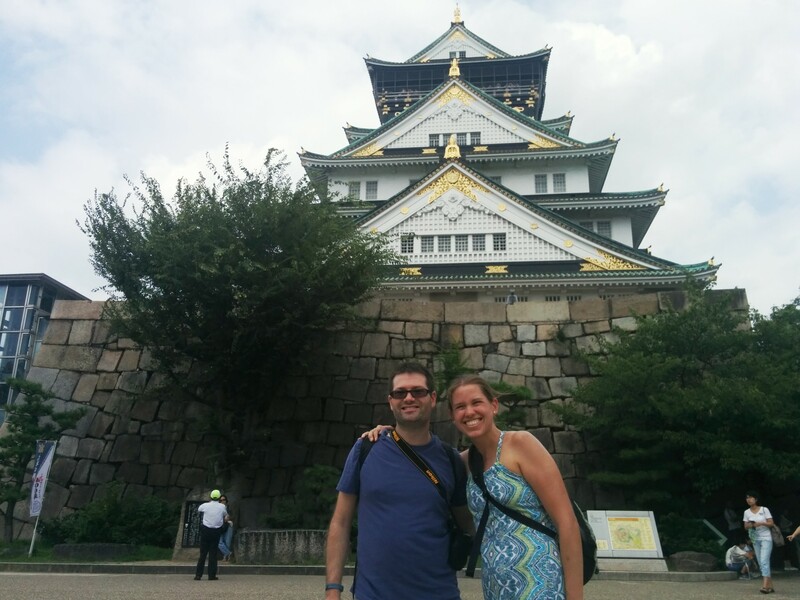 Osaka is known as the kitchen of Japan, and so we came ready to eat. Because we cannot afford to do many of the things recommended by the New York Times, we were excited to be able to follow their advice our first night in Osaka. As recommended, our first stop was Beer Belly Tenma, which served beer from Japanese Minoh brewery, including a delightful peach weizen, and where we also sampled a minced-pork local specialty. Eating french fries with chopsticks at Beer Belly Tenma. Then it was on to Dig Beer Bar, just a few blocks up the road, which sported shwag from several Colorado breweries. 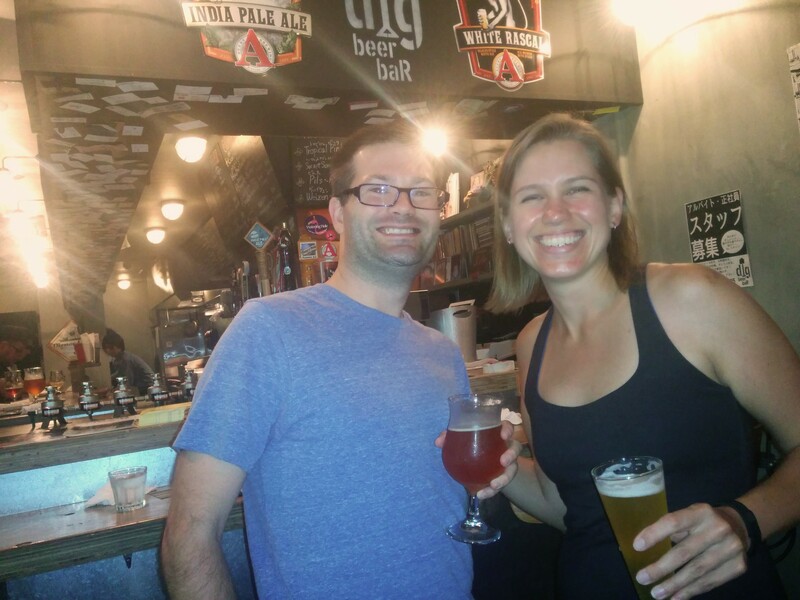 We thankfully visited on a Japanese beer night, and we tasted several additional good local beers, and enjoyed their specialty pizza. It was a great place with a friendly atmosphere, where we enjoyed conversations with the bar tenders, who spoke amazing English, and some fellow travelers from Canada. The New York Times tour covered, we spent the rest of our time exploring other restaurants in the city, including Mizuno, home of one of the most highly reviewed okonomiyaki (egg and yam flour pancakes stuffed with other ingredients) in Japan, and frequenting what is now my favorite tempura restaurant in the world, located in the basement of the Osaka subway station. 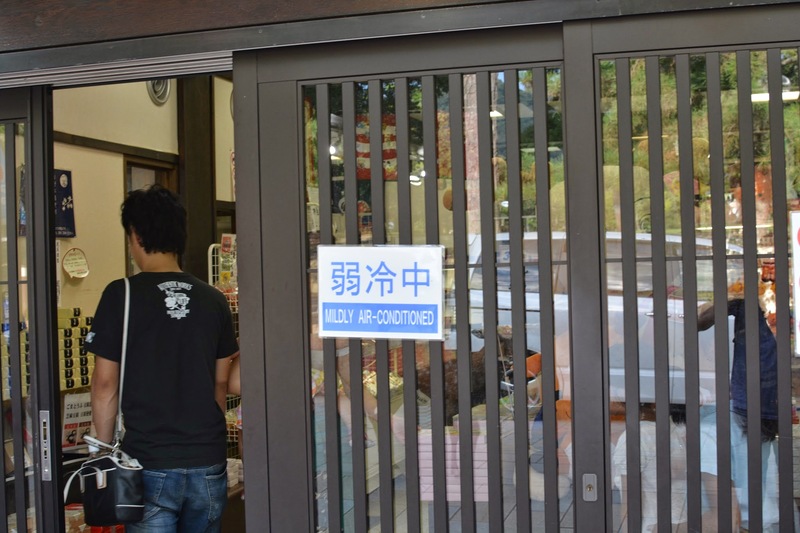 Best tempura shop IN THE WORLD. Want more pictures from our time in Japan outside of Tokyo? Dan’s gallery is here, and Erin’s is here. Nara was the first permanent capital of Japan, from about 710 to 784. The second-tallest pagoda (intricately crafted wood structures built of wood alone, with a tendency to burn down during Japan’s many famous fires) is located in the city, at a height of 52 meters. However, according to a postcard from Nara, “its solemn beauty compares favorably” with the tallest pagoda, located in Kyoto. Nara was a terrific stop. 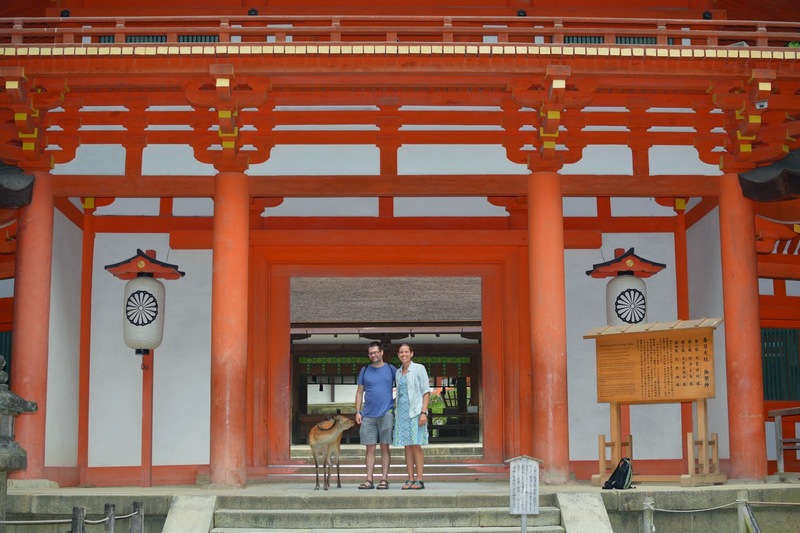 It is filled with temples, shrines, world heritage sites, and deer. According to legend, a god is said to have once visited Nara atop a white deer, and since then, the deer have been respected and protected as “divine messengers.” These divine messengers are particularly fond of deer crackers, Shika Senbei, which can be purchased from vendors in town for 150 yen (about $1.50). Hungry deer will stand outside of vendor shops, belling, urging you to buy them some deer crackers. But, you have to hide the crackers on your way out of the shop or you will be quickly overwhelmed with eager deer. 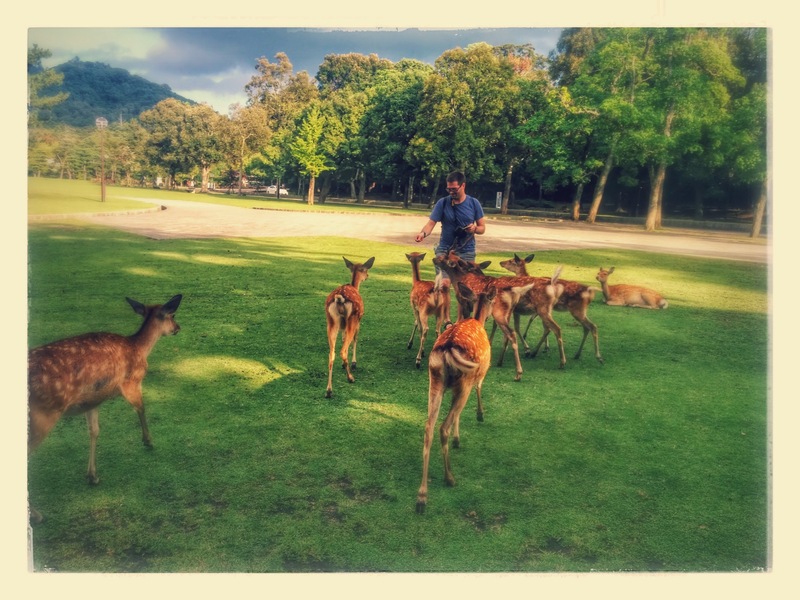 Once you start giving out the crackers, the deer get very excited, and can be just a bit intimidating. I turned around to find a male whose horns had been sheared off standing right behind me, and then I ran, from a bunch of divine deer. After feeding a couple of rounds of crackers, Dan and I sat on a picnic bench to eat a snack and I had deer all over me, rubbing their heads on my legs, and chewing on my map and shirt. Quite fun though. The first stop of our trip was Tokyo. I have always been interested in Tokyo. For reasons that are hard to explain, the city fascinated me. From various stories, images, and videos, Tokyo in many ways has to me seemed like a look into the future. And the people seemed to have such a passion for everything they do. I wanted to see some of this technology– bullet trains, LED stairs, flat screen TVs projecting information and advertisements on every wall and this passion, and the crazy quirkiness of the city that one hears about. Our first evening was spent figuring out how to get internet in our room, which, do to a surprising lack of wireless required not fewer than three cables and an adapter, and getting Udon noodles for dinner followed by a sip of Japanese whiskey at a standing bar. The first real stop on our itinerary was Tsukiji fish market the following morning. It was really interesting to see the largest fish market in the world. I have never really gotten into raw fish sushi. I have enjoyed veggie sushi, tempura sushi, egg, etc… but have I generally steered clear of fish. Trying it every once in awhile to see if my tastes had gotten ‘sopisticated’ enough for real sushi. For years, I had claimed that I would give it another good shot when I can try the very best in Tokyo [NOTE from Erin — Dan wouldn’t actually let us get the very best sushi in Tokyo (see Jiro Dreams of Sushi) something about money and trees.] It became a mantra to the point that it was a bucket list item, to go to the Tsukiji fish market in Tokyo and push my boundries trying a bunch of sushi. We walked the area enjoying some free samples and conversation in the restaurant square across from the market, before heading in to see the whole sellers and avoid getting hit by various people on weird moving devices. 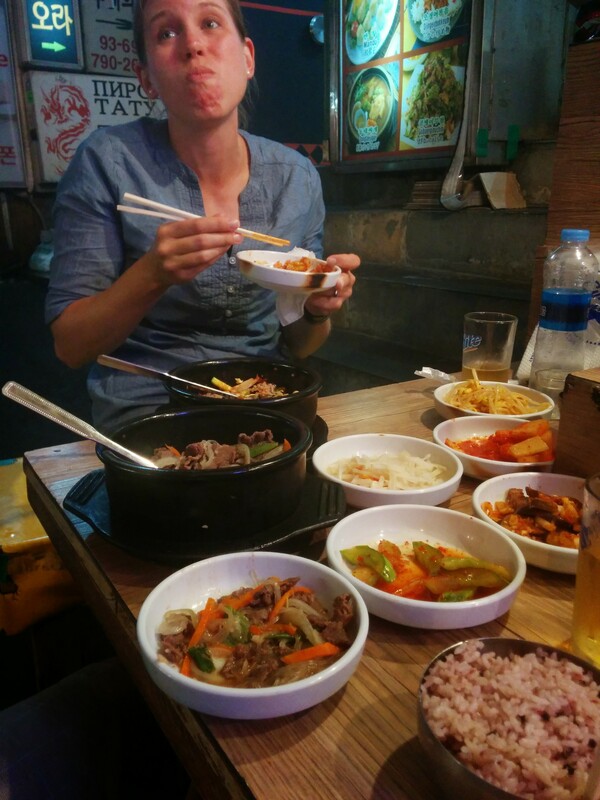 After exploring the market, it was time to go back to the restaurant area and dig in. I got a creative sampler with 6 or so fish pieces. Tuna is the best;) Fatty tuna is the very best (you will see that this is accurately reflected in the price). After our first stop we walked around a bit more and needed to try another place. Our second sushi-bar definitely was better than our first, here we just ordered single items and I really enjoyed my lightly grilled semi-fatty tuna. It is kind of as close to bacon mixed with good steak as one could get. I am sure we will pick up some more sushi for snacks the rest of our time in Tokyo and hopefully I will be happy to add a few fish pieces to my normal eating repertoire back home. Shibuya, Meiji Shrine and neighborhoods. Akasaka, Zipangu restaurant and neighborhoods. One of the reasons I was really excited to visit Japan was to see their train system. Hearing stories of it being the best in the world and how fast the bullet trains were, had always made me want to visit. We bought a 7 day JR Rails pass, and have a Pasmo card to ride the subway. Overall, I have been super impressed. A city with so many people and we hardly see traffic and cars around the city. Many places we visited had major streets shut down allowing only foot traffic making for amazing pedestrian malls. The signs and directions inside the transit system are well done and clear. The staff and security are extremely helpful. It made me wish the US had done a better job with subway systems. The circle around Tokyo city with spokes of major stations connecting through many routes makes it far easier to get from point to point here than in Manhattan where everything is in a straight line constantly blocking one another. It was fun to take the long route to some destinations so we could complete the full Yamanote loop around Tokyo. Really, the system is so clear that without GPS or our phone’s internet initially working we got from Narita airport to Tokyo station on the Narita Express (N’EX) and made our transfer over the subway to our hotel without any problems. The level of detail they have put into making the experience good is simply amazing and awe inspiring. Our bags fitting into overhead space. I don’t know if it was because we watched Jiro Dreams of Sushi on our flight to Tokyo, but I swear that, particularly in the city, you could feel the desire people had to do one thing really well – devoting their lives to perfecting a single task. Combined with the dispersion of technology, this type of culture leads to a cult-like restaurant scene — you can always pick out THE BEST ramen restaurant and THE BEST sushi restaurant by the crowds gathered out front, even when there is another roman restaurant next door, sitting empty. Only one can be the best. It also seems to lead to an intense work culture. We saw people (men, mainly) walking out of their office buildings at 9 and 10 o’clock at night. It’s also possible to understand how that type of work culture could make it difficult to balance a family and a career (and could lead to the low percentage of women and mothers in the Japanese workforce), and could lead also to Japan’s relatively high suicide rate. Though we saw only the public, service-oriented types of work, it was possible to see how it could be hard to sit behind the counter at an empty restaurant, next to one stuffed with young, working, chatting, eating people. On the positive side, it does seem to lead to people taking great pride in their work, which we noticed particularly in using the transportation systems. Workers would literally run down passageways, and if we arrived at a counter when someone else was already asking a question, another person would appear, eager to help us figure out how to get where we were going. Is it gross to sit on a toilet seat that someone else just sat on? Yes, it is. That is why, in public restrooms, you are helpfully provided with either a “Japanese squat toilet” (no need to sit on anything) or a western-style toilet, appointed with toilet seat sanitizer, either in form of wipes or as a sanitizing spray to spray on “50 cm of toilet paper” and wipe the seat. Is it gross to put my bag down on the floor? Yes, that is why even restaurants with no more than 6 seats around a counter provide you with a basket in which to place you bag. The toilets in Japan are amazing. Even the squat variety is easy to use with minimal mess, always accompanied by a flushing mechanism, and often accompanied by a frequently-cleaned bar to use for balance. But, the toilets in the hotels (even our budget hotels) were simply incredible. They came with heated seats, a heated shower (back and front) and a stop button (helpfully labeled in English). 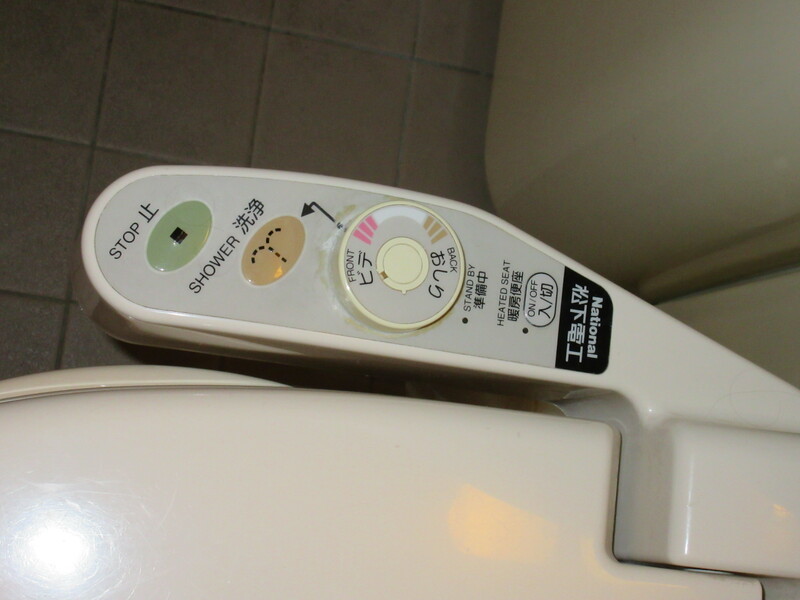 The toilets at fancier establishments in Tokyo also had these types of toilets, but with only the panic/help button labeled in English (all of the other buttons, often has many as 8, were labeled in Japanese only), which made me too intimated to actually try any of the functionality. Dan and I spent days wondering around Tokyo, trash in our hands, pockets, and bags, looking for trashcans. And then, we had dinner with our friends who have been living in Tokyo for a month. They told us that to live in Tokyo, you must have a gomi strategy. Almost no one litters in Japan, but public trashcans are few and far between, and difficult for tourists to find. So, you have to have a strategy. Carry a plastic bag to collect your trash, or, if you buy a can of iced coffee or other good from a vending machine or convenience store, slam it, and dispose of it in the cans located directly outside the store. This explains why you will see business people, sometime after 10 pm, all standing outside of a 7-11, slamming their beers. I have read, seen, and heard about wild and bizarre things in Tokyo. I just wanted to experience and see some of the lovely weirdness of the city. We hit up some neighborhoods known to be more quirky, a show that is known to be amusing and non-nonsensical, and explored alleys searching for the perfect tiny hidden bar. Robot Restaurant is a quirky show of song, dance, and ‘acting’. In theory it is a dinner show, but the food can cost extra and most give it horrible reviews. We chose to eat elsewhere and just enjoy beer and sake with the show. The show doesn’t seem to make much sense but generally has the theme of evil robots fighting the good humans. It was a great way to see some oddball Japanese humor. While it does target tourists locals enjoy the show as well, I believe there were 3 people celebrating their birthday’s at our show. Really the photos and various videos can’t do justice to the spectacle you are immersed in (and if your in the front row occasionally dodging). where am I taking Erin? Piss Alley Bars, not kidding this is what a collection of back alley bars is known as. Even with the amazingly inviting name we decided to check it out. We wandered through crazy alleys with tiny bars that could fit 4 to 6 people. Many dark with stairwells disappearing into the unknown. Eventually we picked a stairwell to find a happy well dressed gentlemen ready to make us cocktails. 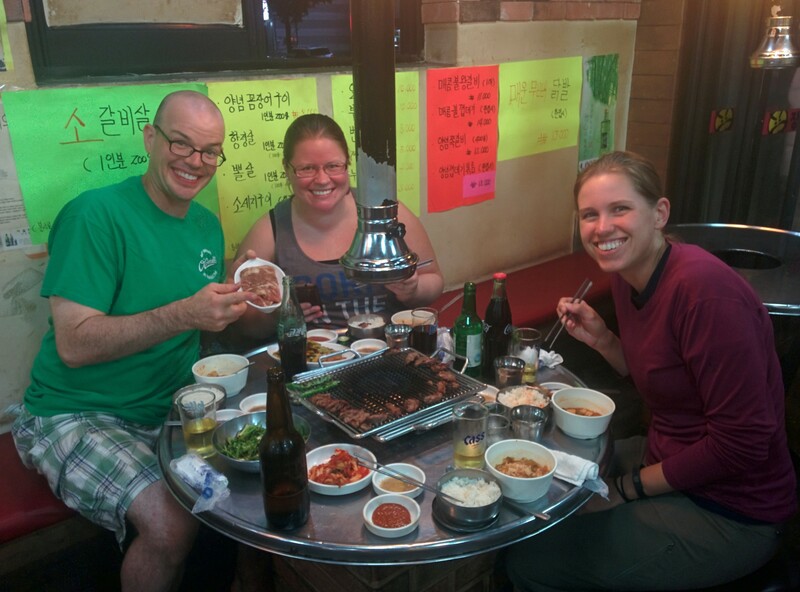 It wasn’t our favorite as we were hoping to find a place with some more locals chatting. The bar tender didn’t know English and we don’t know enough Japanese, but we all had a good time. Akihabara’s Electric City is just wild to me. I like electronics and computers. This place has a lot of those, all trying to beat out each others prices. Although that is what the area was originally known for now that while interesting takes second seat to the manga and video games. The area is full of comic, comic fans in outfits, video game arcades. Giant Sega signs and buildings seem to be around every corned. People waiting in line to see and play the latest and greatest game. It also has a large number of maid cafes, which is pretty funny. We didn’t drop by any but saw plenty of people in costumes trying to get visitors into their shops. The coolest part of this area was that all the streets were completely shut down. So people could wander down the middle of the road and all over the place. It made for great views of the cityscape and pleasant walking as you didn’t have to use all your energy avoiding people. Mildly Air Conditioned In a series of campaigns beginning in 2005, the Japanese government has set thermostats in all government and public buildings to 28 degrees Celsius (82.5 degrees Fahrenheit) and encouraged business to do the same, encouraging business people to dress down for work, with open, short-sleeved shirts. And, while, I think it is fair to say that the most common business outfit we saw was dark pants with a long-sleeved white shirt, we saw very few ties on businessmen, and a few white, short-sleeved shirts in the crowds. I hate the over-air-conditioned feel of so much of the US in the summer (especially around DC), and I hate that I, and half of my co-workers, had to use space-heaters at our work spaces to stay comfortable in the summer, and so, I am quite a fan of the Cool Biz campaign. I will admit that schlepping luggage through 85 degree subway tunnels can make one rather sweaty and somewhat smelly. But I loved not having to bring a sweater when I went out to dinner. I see masses of people all moving in choreographed crowds, always on the left (except in some passageways and stairways where signs indicate that you should stay on the right — this was confusing), feel my neck craning up to see directional signs pointing to trains and metro lines, and hear smiling people saying, “arigatou gozaimasu” (thank you very much). There are about 128 million people in Japan, an area smaller than California (population 38 million). Not enough photos? See Dan’s full Tokyo photo gallery and Erin’s full Tokyo photo gallery (we were trying to merge them, but Google got upset about it). I found the Rough Pocket Guide to Tokyo pretty useful and fun to read on the trains as we approached destinations. 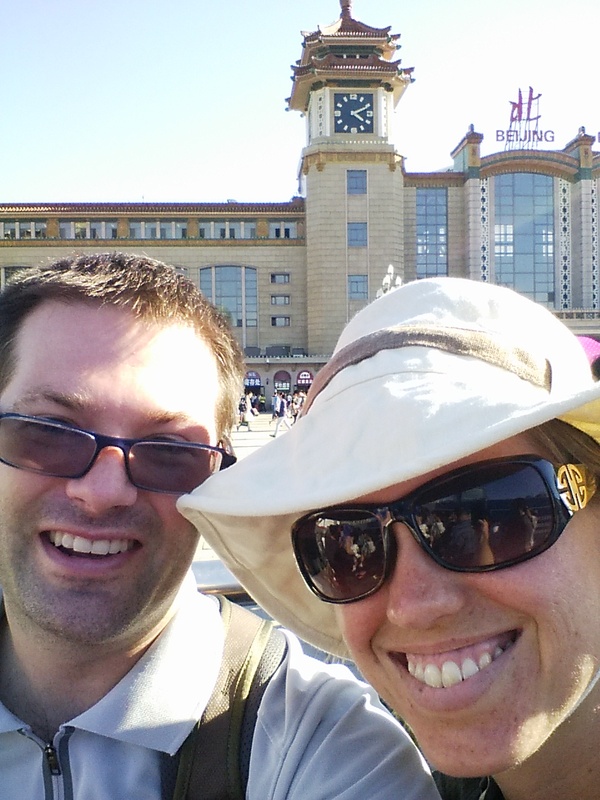 We used the JR 7 day rail pass and thought it worked great for the type of traveling we did. 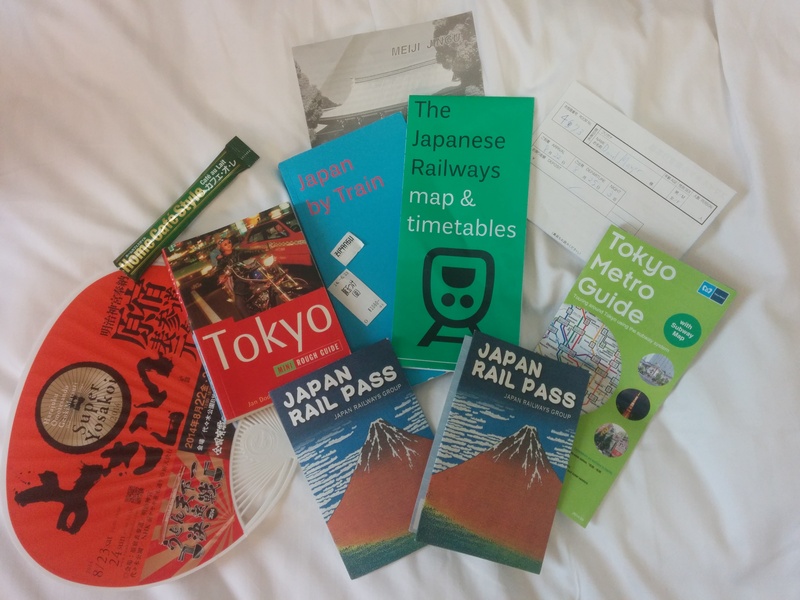 You still need to pay for some subway and buses, but we did a lot of day trips to nearby cities like Kyoto and Nara as well as using the local JR loop line in towns when it made sense. Really just the cost of the Tokyo-Osaka round trip covered the cost.